Here's this brand new product on a successful field trial. This type of sunk line versatility from a single Speyline has never been conceived before. 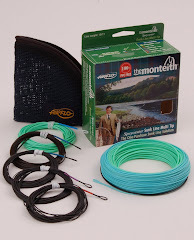 This revolutionary sunk line solution knocks the spots of all other sunk line Speylines for that reason and all ugly flying shooting head systems on price, fishing & casting performance. With the back end now here this product is a must for the sunk line salmon fisher. For more information or to order this unique product Click here.